On our quest to try some new eats! 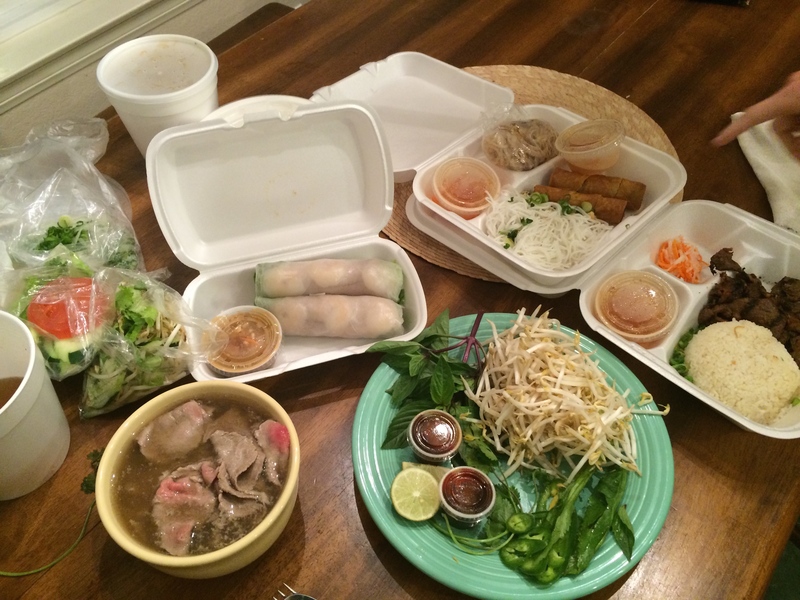 This time we tried a restaurant that many people have been telling us to try, a chain called Pho Ca Dao. According to one of my kid’s teachers, if you aren’t swearing, you aren’t pronouncing it correctly… I hope she wasn’t pulling my leg. The daughter’s boyfriend helped us order and he picked some winners. We loved the soups, the pork with rice noodles were meh. Egg rolls- fabulous, spring rolls- less so. I think I am spoiled by having friends make home made spring rolls on many occasions, though. Yum! Beef with rice, pork with rice noodles and egg rolls, spring rolls, beef pho and chicken pho with all the condiments- love the sprouts, basil and cilantro!